Seattle City Light officials say they still don’t know why more than two dozen utility poles collapsed near the Museum of Flight last Friday, with one plunging through a car, narrowly missing its two occupants. The city utility has yet to hire a third-party investigator to review the incident, Smith added. Finding a qualified firm to conduct the review is taking longer than first thought, she said, though utility officials are now in talks with a national engineering firm. 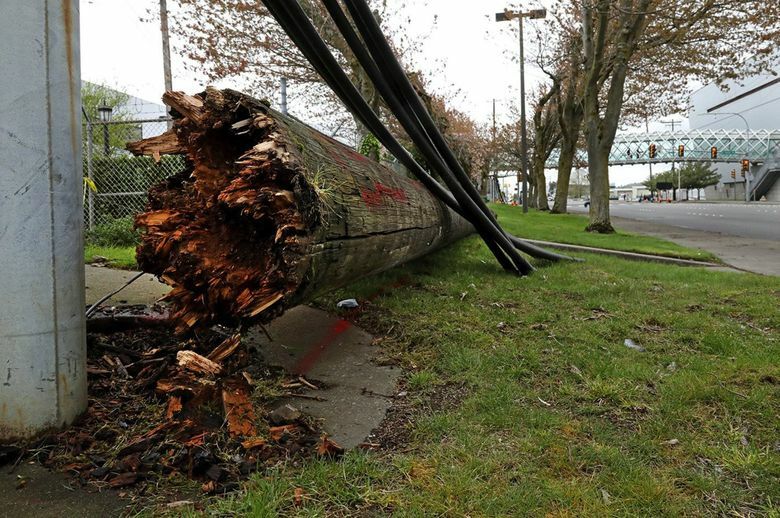 City Light released more details Thursday about a December 2016 inspection of all 26 poles that came crashing down amid a tangle of live wires along East Marginal Way in Tukwila about 4 p.m. April 5. The poles were a mix of privately and publicly owned structures that ranged significantly in condition and age, according to the utility. The two oldest poles were installed in 1954, and the five newest went up in 2011. The 2016 inspection assigned priority ratings on a scale of 1 to 5 based on the condition of each pole, but none of them were flagged as P1, or needing immediate replacement, City Light said in a statement. A rating of P2 under the industry standard rating system doesn’t require immediate replacement, but maintenance is suggested within a “practical timeframe,” the utility said. The eight poles were scheduled to be replaced within City Light’s current six-year improvement plan, but Smith said Thursday she didn’t immediately know when the replacements were supposed to occur. Julie Moore, a spokeswoman for the utility, said City Light has removed and secured the poles, but isn’t allowing the public or media to see them. The utility posted photos of them on a city blog. “We have them in a secure yard and they are tarped over to keep them safe from the elements while awaiting further inspection as part of the third-party investigation,” Moore wrote in an email Thursday. On Thursday, a piece of a pole was seen just off the road. 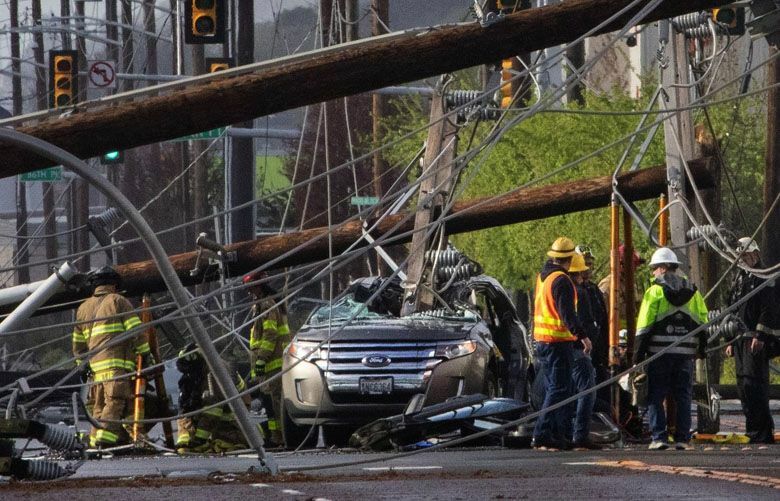 Tukwila police released video this week of part of the poles’ collapse, capturing the near catastrophe of the pole that smashed through the car, leading to the astonishing rescue of its occupants. Other footage showed a bicyclist narrowly escaping a toppling pole and wires. The pole that struck the car wasn’t the first pole to fall over, Smith said. Officials are hoping to recover video from neighboring businesses, possibly including Boeing, that could help unravel the mystery of what happened, she said.